Hello, everyone out there, it is Inge here again. Jenny and I had a great morning at the studio of PZ Conservation a couple of months ago. 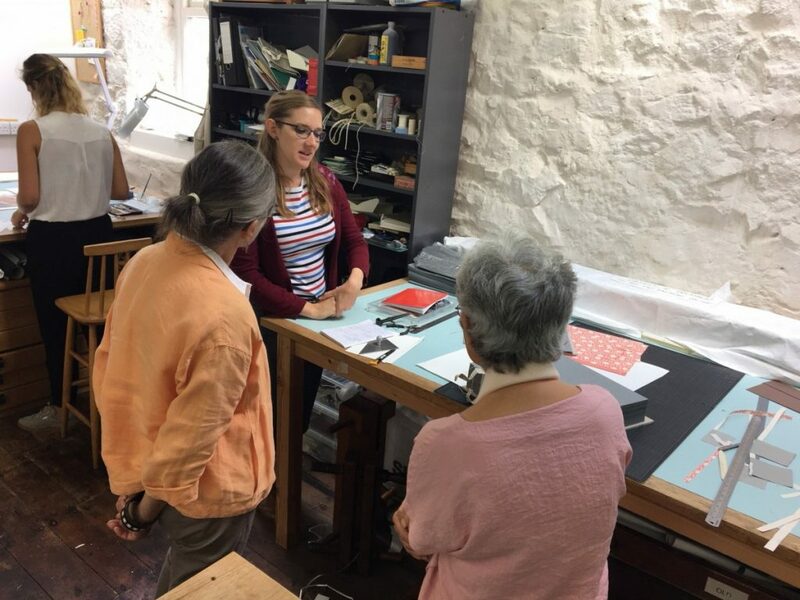 We very much enjoyed all our training days by Keira and Hollie of PZ Conservation in the past, so when Hollie suggested for us to come and have a look around the studio we jumped at the chance. The spacious studio is housed in an old net loft which by itself gives it a wonderful ambience. On our arrival we were treated to coffee and biscuits (they make good coffee at PZC!) and had a talk with the three conservator trainees Hollie, Lucy and Erica, finding out about their completely different educational paths that finally led them to Penzance. Very interesting. Hollie showed us a notebook she was in the process of finishing. The precision involved in the sewing together of the pages or folios was amazing and her patience to achieve this must have been considerable. It was a beautiful piece of work. She then explained how the covers and the spine would be added to complete the book. 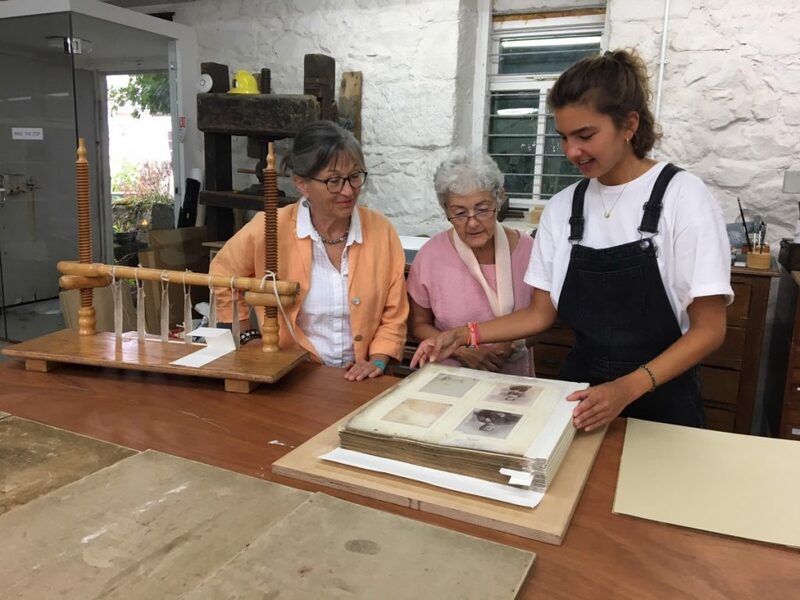 We moved on to the large work table in the centre of the room where she was working on conserving a large photo album containing photos from the 19th Century. 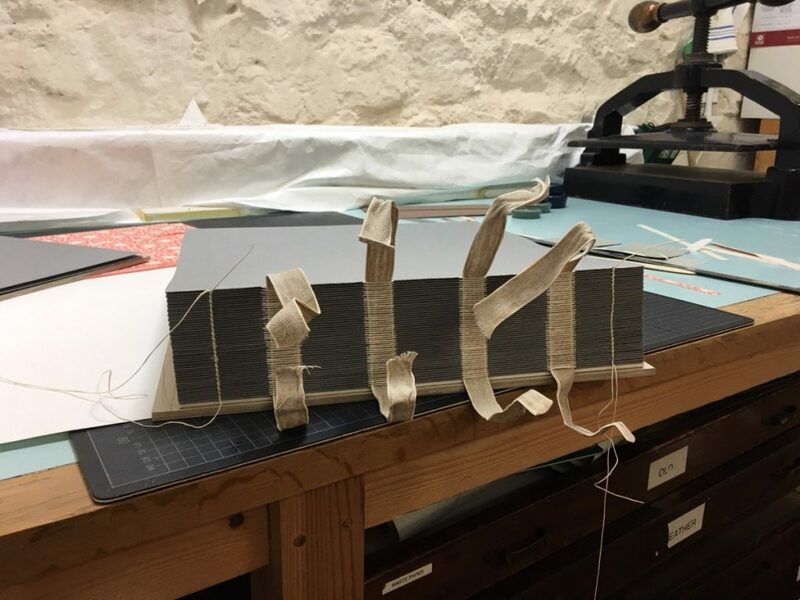 The book was fragile, the covers had to be replaced and to strengthen the book Hollie had attached several spine linings of leather and hand-made paper. Hollie explaining the repair on this large photo album. The frame on the left of this photo is used for attaching spine supports to books as in the photo below of Lucy’s scrap book. Image © Hollie Drinkwater. At some point the conversation moved to the use of parchment in some very old books. Parchment is animal skin, usually from sheep, goat or calf, which is created by gradually stretching it on a frame after soaking the raw skin in a bath of lime. Its uses go back as far as 2500 BC. It was in use until the end of the medieval period when it gradually was replaced by the much cheaper paper. We admired the scrap book that Lucy was in the process of making for communities across Cornwall. You can see on this photo how the book is made up of a “stack” of folded over pages called folios. Holes are punched through the folded ends at regular intervals through which a sewing needle with a linen thread is passed going in and out from one end to the other incorporating strips of material called sewing supports. You can see these on the photo. More sewing is required to hold the book together. Again it is all incredibly neat. We were hugely impressed by it. Lucy talking about the scrap book in the making. Image © Hollie Drinkwater. Lucy’s scrap book. Image © Hollie Drinkwater. We moved on to watch Erica who had a badly “eaten” document in front of her (I think they call the bits of missing paper “losses”). She was trying to repair these by replacing them with similar paper that was going to be stained in a colour as identical as possible to the original. For this she was experimenting with mixing colours from a watercolour set. Her commitment to precision was admirable. Erica showed us some samples of colour matches which looked perfect to me, but they were not good enough for her. She kept on experimenting. ……but on second thoughts working for the Heritage Centre is such fun that I would not want to change anything.